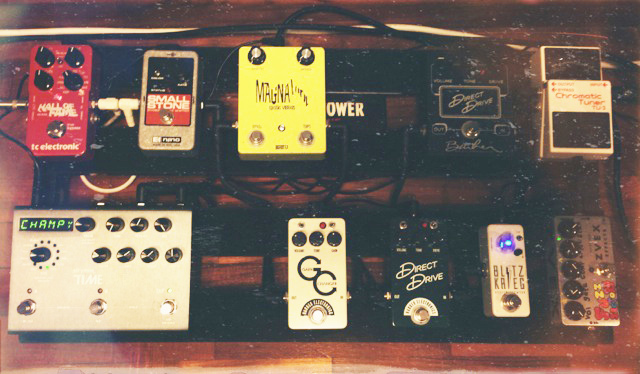 Today’s pedal line is from Jonathan Oh. If you have a pedal line (doesn’t have to be in a board) for your rig, please email me a photo, bio, description of pedals and routing to pedalline@nulleffectsbay.com. Every Friday I’ll showcase a pedal line submission. Make sure you include any links to your band or music page. This is my pedal board! It’s a Pedaltrain PT2. All effects are powered by a Voodoo Labs Pedal Power Plus 2. The effects chain goes like this – Boss Chromatic Tuner TU-3 > Zvex Fuzz Factory Vexter Series > Goosesoniqueworx Blitzkrieg Buffered Boost > Barber Direct Drive w/ PCB Mod > Barber Compact Direct Drive > Barber Gain Changer > Bigfoot FX Magnavibe > Strymon Timeline > Electro-Harmonix Small Stone Nano > TC Electronic Hall Of Fame. As you can see I like Barber pedals. They are well made and sound more organic than any other drive pedals I’ve ever had (includes the OCD, Tubescreamer, Signa Drive, etc.). Both the Direct Drives are made to sound like Marshalls and my goodness they nail it. The Gain Changer does the American sound and it’s so so good. Both the GC and DD are the most versatile pedals you can get too without any lack in quality. Both can do their respective clean tones and driven tones in the flick of a switch. I normally keep my amp clean and maybe just on the verge of breakup. I like to rely on pedals to provide the drive especially when I have to play on rigs that are not mine. I think the pedal that needs a good mention is the Magnavibe. I’ve always dreamt of owning a Magnatone but never had the chance or money. So I asked myself what did I like about them? And of course, it was the vibrato. Did a little research and found this dream pedal on eBay. It’s an incredible pedal. Even with the vibe turned down low, it adds a certain divine fullness to your tone. The other pedal I’d like to mention is the Blitzkrieg Boost. It’s a fat sounding boost that retains clarity while adding body. I use it to tame the highs from my Fuzz and to drive the amp over the top. It’s locally built in Singapore where I come from and I always love showing support for the local industry. I run these pedals from a 89′ Strat Plus Deluxe and into a Ceriatone DZ-30 with a WGS Veteran 30 and Reaper HP. I play mainly indie and alt rock with blues, psychedelic rock and shoegaze/nugaze on the side. Check my band out, we don’t have stuff on yet but we will in a couple of months. Thanks effectsbay! I hope you can choose my board for the Pedal Line Friday! Pedal Finder Give AwayFCC Regulations for Pedals!